This industrial inspired pie-shaped cocktail table is the perfect piece for a corner seating arrangement. 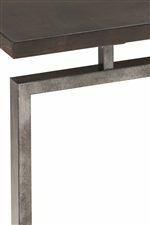 The platinum charcoal finish of the wood paired with the gun metal finish of the legs give this table a unique look. The floating table top also ties in with the modern style. The Alton Contemporary Pie-shaped Cocktail Table with Casters by Magnussen Home at AHFA in the area. Product availability may vary. Contact us for the most current availability on this product. Contemporary in style the Alton collection also shows details of industrial influence. The wood is finished in a platinum charcoal that contrasts nicely with the gun metal finished legs. The geometric frame work of the metal gives the illusion of floating table tops throughout the collection which reflect the modern, contemporary style. This collecting will add dimension and contrast to your homes decor. The Alton collection is a great option if you are looking for Industrial Industrial Contemporary Contemporary furniture in the area. Browse other items in the Alton collection from AHFA in the area.